WAFFLES: Happy New Years, Boss!!! Have you made your solutions yet? KATIE: Solutions? Don't you mean RESOLUTIONS? 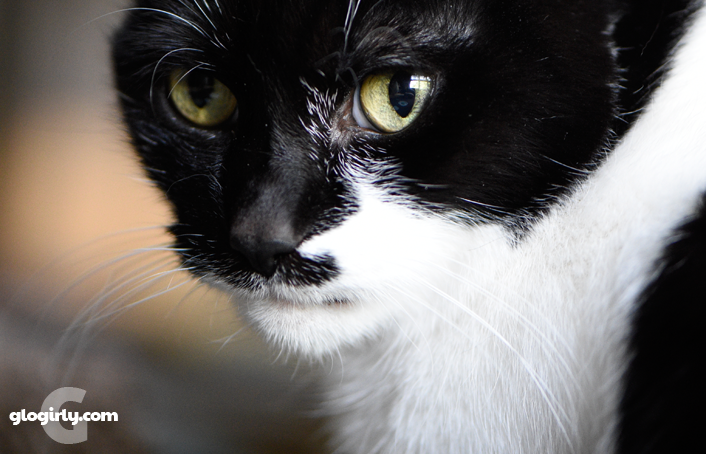 WAFFLES: Yeah, you know... like all the stuff you're going to do better. 3. Play with Katie's toys. 4. Sign up for How to be a Chicken Rancher Correspondence Course. 4. Sign Waffles up for How to be a Chicken Rancher at the University of Siberia. 5. Enough already with the chicken. May 2015 bring you health, happiness, love & laughter. I resolve to lose Ichiro in the move! Happy New Year, pals. We love ya! Sounds like your ALMOST match up. MOL! 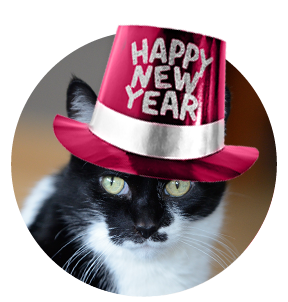 Happy New Year, sweet furriends! MOL! I let Binga do the resolutions this year. Well, I didn't have a choice. Thank you, GloGirly, GloMan, Katie, and Waff for letting us peep into your lives this year, and for many to come. Happy New Year Glogirly, Gloman, Katie and Waffles!!!! May you have the best year ever and may all your wishes come true! Waffles, it's a given that you will get more chicken this year. And Katie, sorry to say that I think Waffles is staying out at the Townhouse. You are still the Queen!! Have a Happy New Year to Glogirly, Gloman, Katie and Waffles! Happy New Year to all of you! Love the resolutions. Happy New Year!!!! Our resolutions are to eat more food. & get as many treats as possible. Happy New Year! Thank you for the smiles you bring every morning. You've got some "interesting" New Years resolutions!! Happy New Year dear friends from all of us at Brian's Home! Whoa, chicken rancher? Waffles, do you think you can supply chickens for Ashton's upcoming chicken restaurant venture? Happy new year to both of you (and Glogirly and Gloman, too!). A chicken in every pot or something like that! Happy New Year and blessings to you and yours from the Zee and Zoey Gang! OH Waffles you are going to be a chicken extraordinaire in no time! Happy New Year to the Glofamily..I love your party hats Katie & Waffles!..You know Waff..if we had the solutions to our resolutions they might be easier to accomplish..mol.. Happy New Year's to you Katie and Waffles, and your beans too! We like your solutions, especially the chick-hen part Waffles. Happy New Year friends. Maybe have Waffles visit the neighbors more often. Happy New Years Katie and Waffles. Happy New Year to both of you and the Glopeeps. 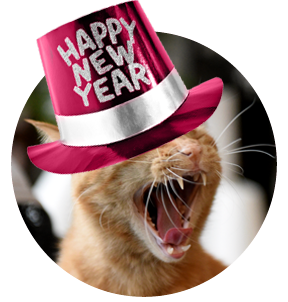 Wish you and your humans a Meowmy Happy New 2015 ! Happy New Year to everyone from La Casa Keisha! 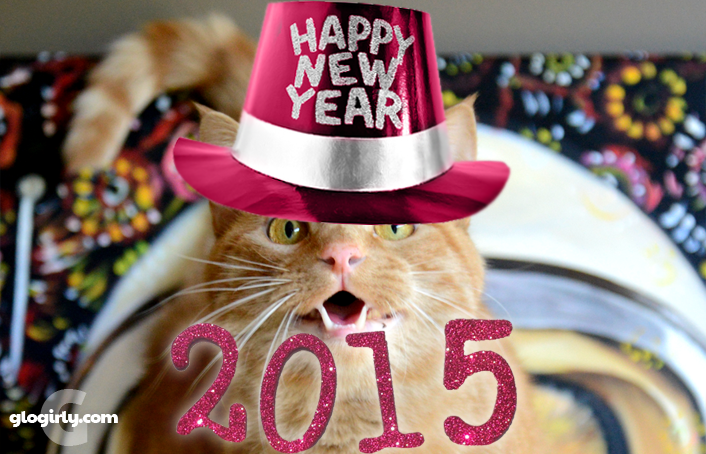 Here's to a wonderful, healthy and prosperous 2015 filled with great food, love & cat adoptions. Are there really chicken ranches in Siberia? Happy New Year, best of health and all things good in 2015. HAPPY HAPPY NEW YEAR TO ALL OF YOU! Happy, Happy New Year's to You All! We love your New Years Resolutions Katie & Waffle's! Happy New Year, Waffles and Katie! Happy New Year to all at the TownHouse!